I love flying this wonderful classic airplane. Real pilots drag their tails in a conventional gear airplane. Conventional gear is what airplanes conventionally had before the introduction of the tricycle type gear mostly seen on newer models of airplanes. This airplane is a 7-AC Champ serial number 1142 and was manufactured by Aeronca, the Aeronautical Company of America, in 1946. The construction is tube and fabric. It was certified with no electrical system. This means no lights, no radio, no instruments and no starter. You navigate by pilotage, that is, you look at a map and keep track of where you are as you go. No lights means you fly during the day and land before evening civil twilight. It has no starter which means you pull the prop by hand to start it. 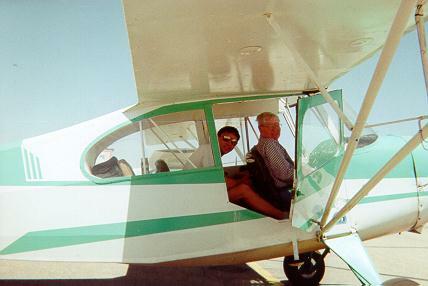 Historically more people have learned to fly in J-3 Cubs and 7-AC Champs (such as the one pictured) than any other airplane in the world. Of course most of those people learned to fly just after the world war II era. 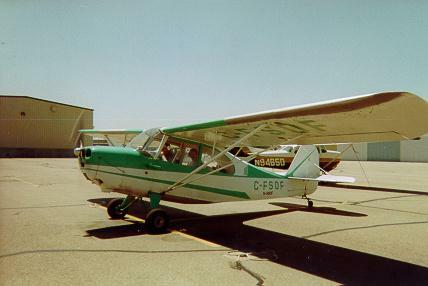 At that time this type of aircraft was a basic flight trainer. If you were learning to fly, you learned in a similar airplane. In the 1950's "safety gear" (tricycle gear) became a popular alternative to conventional gear. Tricycle gear has been increasing popular ever since. Tricycle gear airplanes are mostly restricted to landing on hard surface runways. A mild amount of soft surface is tolerated but tricycle gear aircraft do not intrisically do well on rough surfaces. This is a disadvantage of tricycle gear airplanes. However, they are very stable on landing and almost no skill is needed to make a tolerable landing. This is their big advantage. It is like driving an automatic transmission in a car. Easy to get going with very little to learn. Conventional gear airplanes were born on rough surface fields and that is where they perform best. They are the proverbial "bush" airplanes of the frontier. The disadvantage is that no small amount of flight skill is needed to land these tolerably. There are two main types of landing proceedures, 3-point and wheel, and the tailwheel pilot needs to be proficient in both types. This makes the entry to flying a conventional gear airplane more difficult than flying a tricycle gear airplane. It is like driving a standard transmission in a car. It is a little more difficult than the automatic. But the skilled driver can get more performance from the vehicle in a standard than an automatic transmission. 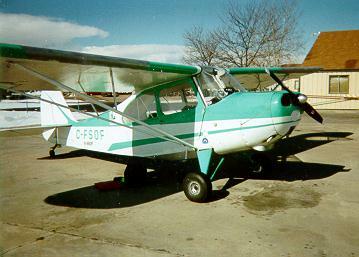 Today's pilot typically learns in a Cessna 152 with tricycle gear, electric starter, radio, and global navigation system. That would be considered a modern airplane. However, I think you lose some of the magic and the romance of flying in those airplanes. This last closeup picture is one of me flying a friend's dad. I am in the rear pilot position peeking out the door to smile for the camera. There is not as much visibility in the back seat as in the front. But it is actually quite enough to fly safely. You do need a a good feel for the airplane, however, because you can't see straight ahead from there. You have to taxi making S-turns and peek around the side of the nose of the airplane. Champs such as this one can be flown from either the front or the back. 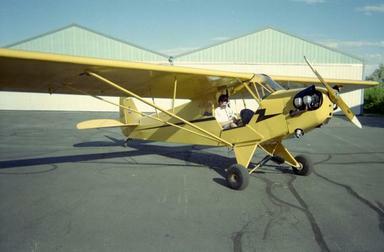 But the classic Piper J-3 Cub is flown solo only from the rear seat. I fly both and so I try to keep as proficient as possible from the rear seat. Nothing else flies like a Cub. 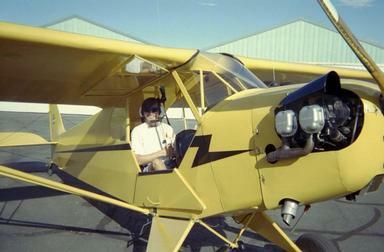 Randy Hensley took a picture of me flying this 1946 Piper J-3 Cub. It is joy to fly this classic airplane.